The weather remained fine for this year's St Pauls Carnival with about 70,000 people attending the event. The carnival known for its flamboyant carnival costumes and entertainment, celebrates African Caribbean arts and culture in Bristol. The carnival, now in its 41st year, celebrated the theme of culture, identity and unity. 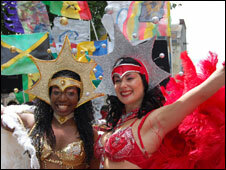 St Pauls Carnival spokesperson Andrea Adcock said the carnival was absolutely amazing and "the best one ever".